The days of waiting patiently for the postie to arrive with your DVD of the latest blockbuster must surely be coming to the close with the news that Lovefilm is introducing HD streaming. After announcing an exclusive deal with NBCUniversal yesterday, Lovefilm have continued their charm offensive with the news that it will be offering HD streaming for its “Instant” service. Subscribers in the UK and Germany can regale in the glory of full 1080p content when accessing the service on a Mac or PC, and 720p when watching via Xbox 360 or Smart TV (UK only) at no extra cost. The HD library currently only offers a small smattering of films, but that will increase as the service is rolled out. 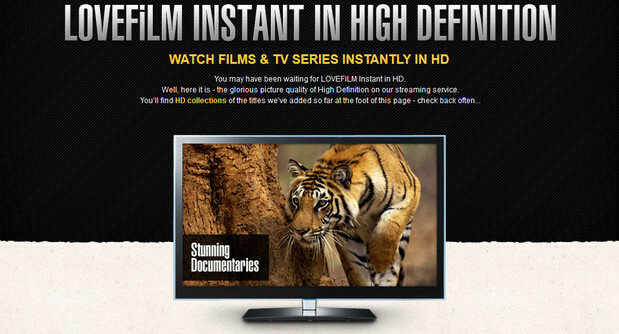 LOVEFiLM, an Amazon company, today announced the launch of high-definition (HD) service, giving LOVEFiLM Instant members crystal clear viewing. The HD functionality, available from today in the UK and Germany, will allow members of LOVEFiLM – Europe’s largest subscription service instantly streaming films and TV series over the internet and sending DVDs and games by post – to stream top quality films and TV series on demand and for no extra charge in HDTV resolutions up to 1080p. LOVEFiLM members in the UK, using PC or Mac, will enjoy content in full 1080p high definition, while members using their Xbox 360 or Samsung and LG connected HDTVs will enjoy 720p resolution. In Germany, HD content will be available initially on PC and Mac in full 1080p high definition. The catalogue of HD films available to LOVEFiLM members will expand over the coming weeks and months. In the UK titles will include teen sensation The Twilight Saga: Eclipse, family favourite Gnomeo and Juliet and British comedy Four Lions. Top US TV dramas including LOST and Ghost Whisperer will also be available alongside a whole host of British titles, including the BBC’s popular documentaries Human Planet and David Attenborough’s critically acclaimed Planet Earth. Films and TV series available in HD will automatically stream with the improved quality where an internet connection can support it. For 720p streaming members will require a minimum internet connection of 4mbps, while those with connections of 12mbps or higher will enjoy full 1080p where possible. LOVEFiLM offers thousands of on-demand films and TV series via LOVEFiLM Instant, together with the largest selection of DVD, Blu-ray and games with packages starting from as little as £4.99 per month. This will certainly decimate DVD sales, but I don’t think it will eliminate them entirely. Last year there were 26 million downloaded Albums- and 86 million music CDs sold. The trend towards downloading continues, but CDs are still waay in the majority. Apart from anything else, CDs and DVDs make good presents in a way downloads simply don’t…..